The dry pollen of the hydrophily herbaceous plant Typha angustifolia, T. orientalis Presl or sibling plant of family Bulrush. Zhejiang, Jiangsu, Anhui provinces in China. 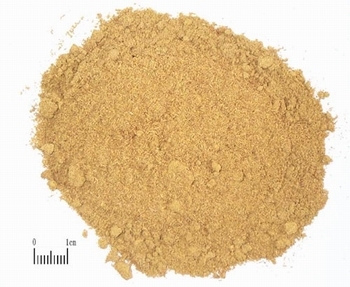 Dry, bright yellow color, light, fine and velvet, cleaned and purified. ground and screened; unprocessed or stir-baked. Stop bleeding, resolve stasis, induce diuresis. This herb is sweet in flavor and neutral in nature. It is good at stopping bleeding astringently with the actions of promoting blood circulation and resolving blood stasis. The characteristic of this herb is similar to that of San Qi. Both can stop bleeding without retaining blood stasis. It is indicated for various bleeding due to heat or cold, with or without stasis, especially to excess syndrome with stasis. For traumatic hemorrhage, it is applied on the wound externally. For hematemesis, epistaxis, hemoptysis, hematuria, metrorrhagia and metrostaxis and so on, it is infused in the water alone. It is also combined with other hemostatics. This herb is pungent in flavor and can promote blood circulation and induce menstruation, remove stasis and alleviate pain. It is indicated for traumatic injuries, dysmenorrhea, postpartum pain, pectoral and abdominal pain due to blood stasis, especially indicated for gynecological diseases. For traumatic injuries, it is used singly or taken with warm wine. For pectoral and abdominal pain, postpartum pain and dysmenorrhea, etc. due to blood stasis, it is reinforced by the combination with other stasis-resolving and pain-alleviating herbs. For instance it is combined with Wu Ling Zhi in Shi Xiao San from Tai Ping Hui Min He Ji Ju Fang. This herb can not only stop bleeding but also induce diuresis. So it is indicated for stranguria and hematuria. It is usually combined with herbs of clearing heat and cooling blood, inducing diuresis and relieving stranguria. For instance it is combined with Sheng Di and Dong Kui Zi in Pu Huang San from Zheng Zhi Zhun Sheng. Decoct 3~10 g wrapped. Proper dose for external application in powder or mixed. Stir-bake it for stopping bleeding; use the unprocessed for removing stasis and promoting diuresis.